i really enjoy using snapmaker. it is much fun to test this awesome product. But i have some problems with the laser module. i testet it on wood, and it went without any major problems. No i tried it agein, and i didnt get it done. i tried it with different algorithms, and with different focus which i adjusted directly at the module. allthough i already installed the new driver for the printer. Does someone have information for me to do a workaround? I just tested the laser module yesterday for the first time. 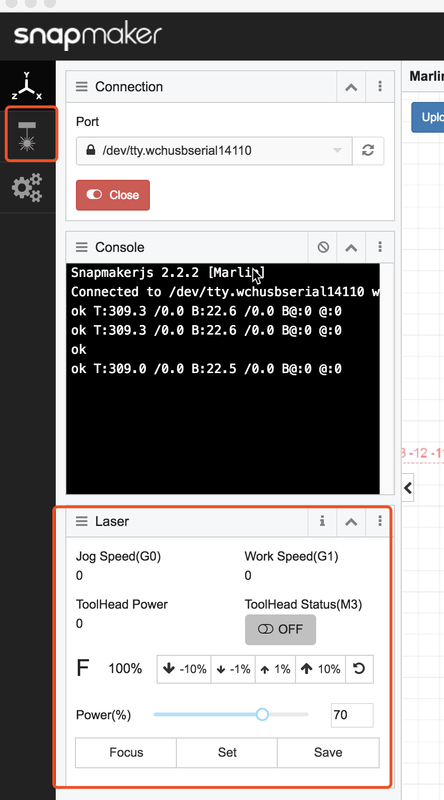 At first I did not saw the laser configuration in the snapmakerjs software either. Then, I realized that the connection did not worked properly. I am using a Mac. 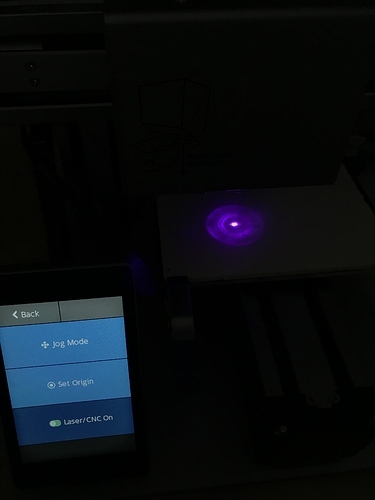 After reading the readme file that came with with the driver and reinstalling the driver it connected correctly and I saw the laser config. I have to select the port: /dev/tty.wchusbserial1410 for the connection to work. That’s my daughter who operated the machine. She first scribed a mandala in B/W at 100% power on baltic birch and the results was perfect on first try. She then try a photo like you did but the results were not good. Your engraving was much better. I guess there’s gonna be a learning curve there. 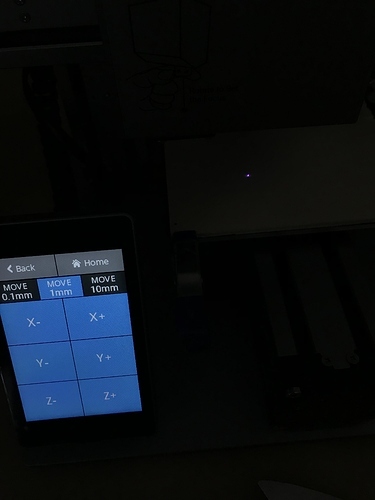 Checkout Laser widget(You need to set up laser module and connect to it first) and Laser Tab. 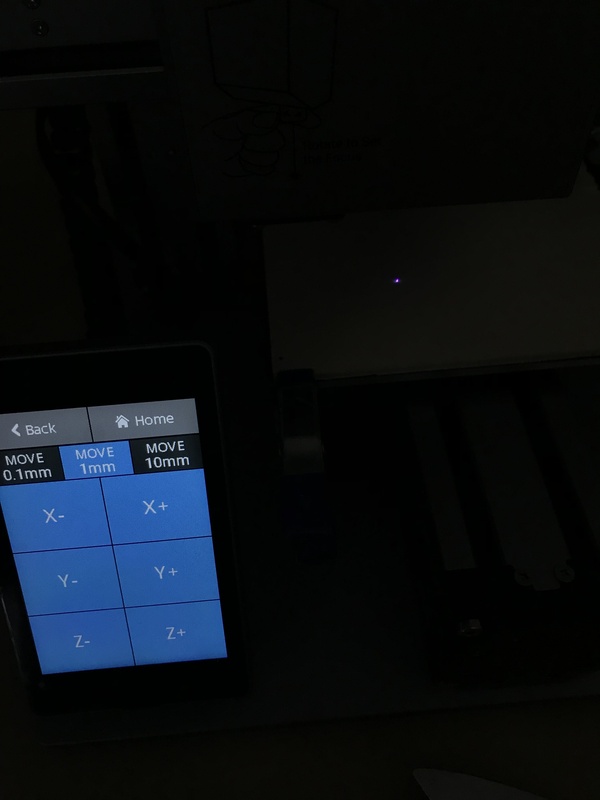 @pierre_l Try adjusting laser power and moving Z-axis to focus laser. After updating snapmakerjs to 2.2.2 the laser widget appears now. I tried it again to engrave, but i think my laser module is defect. i dont know how to test it. 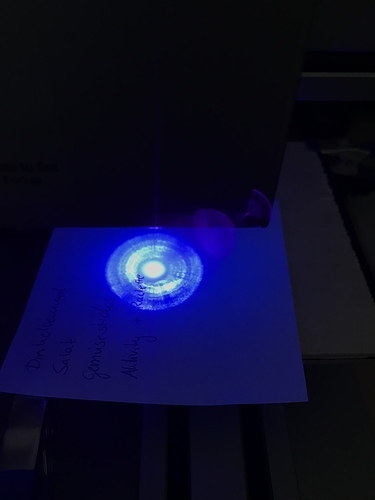 But in this video (https://www.youtube.com/watch?v=aQ2m4sNiFB8&feature=youtu.be) you can see, that my laser doesnt even has the power to cut through paper. Maybe my workflow is wrong, but i dont know, what to change now. 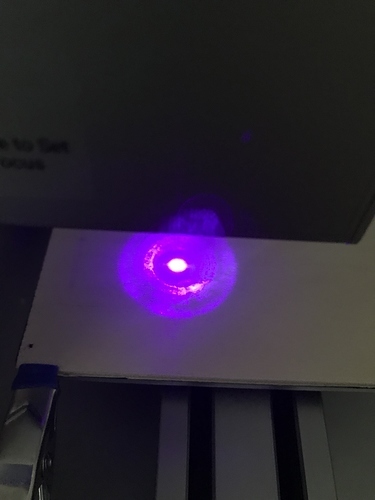 here are photographies from my “focused” laser point. i think there might be a problem with the focus, but it wont get better, when i adjust the z-Axes, i tried also to rotate the focus on the laser module. Maybe somebody can help me. tried with another pc too. When you click on focus, the laser is turned-on at low power. It won’t cut paper at that power level. Did you tried to adjust the focussing ring on the head. With the focussing ring on the head fully tighten, my focus point is about 34 mm away from the end of the laser focussing ring. I suggest you try it anyways to scribe a simple B/W exemple on wood or mdf so you could play with the power. Here picture of my laser in focus and engraving results. I hope your laser is not defective. rapidly coming to the conclusion that the laser is faulty.! I tried which overall failed to deliver probably because they just did not have the ability/software installed to drive the Snapmaker) I am also observing that things seem to be switching in the Consul Widget between CNC & Laser like it can’t make it’s mind up exactly what it is supposed to be doing which looks to me like a ‘bug’ and is effecting laser engraving. I’ll persevere a while longer as I have not given up the idea it is ‘operator error’! I tried a few constellations now, even a black and white example. But my laser doesnt even has the power to burn into paper. So i’m really sure, that the laser is defectly. i hope there is the opportunity for a warranty exchange. Anyone knows which way to go for warranty? CNC motor speed and not go for a Perspective view as this will lock the display up and one has to restart the program. 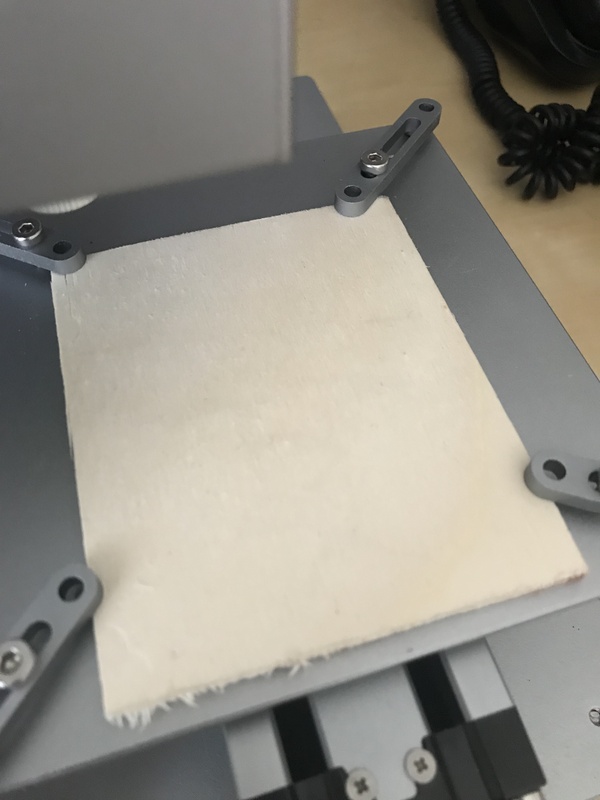 However with these starting .‘glitches’ I have found out that this machine is a top flight product and capable of better quality of 3D printing than I have been used to and even with the starting ‘glitches’ I can see it can produce excellent laser engravings and fine high quality CNC carving so early days. A bit of a shame the software is not as advanced as the machine mechanics and engineering but guess that will come with time… well I hope so.else I will have to write my own software. i agree with you. the quality of the printed 3D Models is awesome, exactly within 1/100 mm, thats really top. But i dont think its a software issue in the laser. perfect result it did when first used sadly. make a focus gauge out or a piece of photopaer or a piece of fine spring shim brass, (paper has no spring). and cut it to your work/laser head distance. eg in my case 40mm. the laser lens mount and then on fine Z control (+) activate till the gauge falls away. Do you use the fixtures to immobilize the material? If you only fix one corner of the material, it may not be flat enough for the laser to stay focused. Do you remember which of the following was engraved first? The right one or the left one? 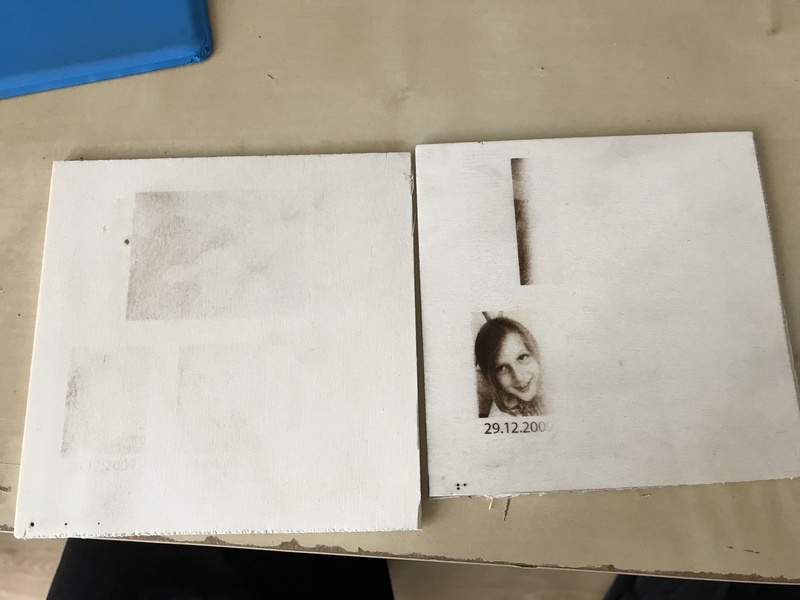 The right picture was engraved first, picture on left side was engraved Second. I use fixture, so that the material cant move and is flat. Isnt is possible to warranty exchange the module, to Check if this is the problem? How does it turn out after you fix all the 4 corners of the material? Could you please use this G-code to test if the laser module is defected? Please use 100% power and B&W mode. Please send photos of the results to us. Once the problem is verified, we will send you a new Laser Engraving Module to replace the defected one. i took a few videos and a picture of the "product"
I would like to have a videocall with you to better identify this problem. Could you please tell me what is a proper time for you? I am available from 9:30 am to 8:00 pm CST, Monday to Saturday. i’m waiting for you to call, didnt you get my email? No. I don’t see your email in the inbox of support@snapmaker.com. Could you please send it again? I sent you a email today afternoon. I would be pleased if we could solve this problem early. I want to start projects with my pupils in near future. Hope we’ll find a solution for my problem. So i think we should take this video call as soon as possible.